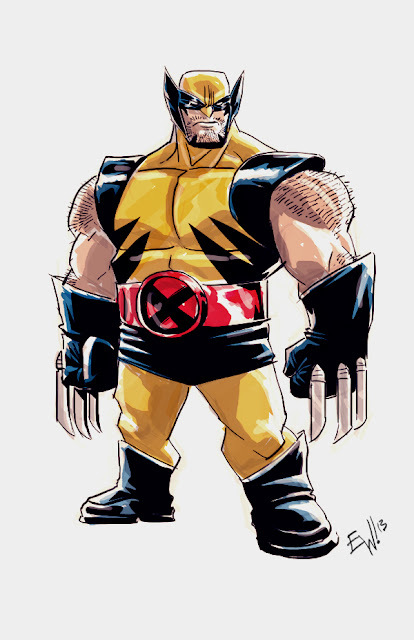 This morning's 30 minute warmup, of Marvel Comics' Wolverine. I wanted to push proportions and exaggeration in my existing style and see what I could come up with, play, have fun. I then inked/ colored it. Not too shabby :) Just for fun did sketchy-by-hand 'inkwash' style colors. Kinda look like prismacolor markers or something. Alright, onto work rest o the morning. What are your thoughts on this versus my normal style? 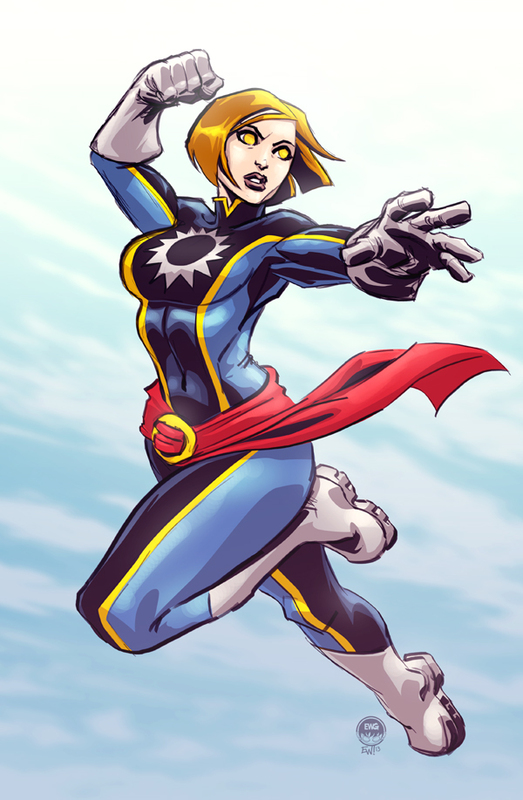 And on the small tweaks to the costume design I played around with? To work I go! Tonight's EWG Wed Night Livestream will feature a 2-hour only edition of the usual weekly stream, and will focus on from-scratch digital pencil layouts and rough pencil renders with the client approving/ making changes along the way live. Come out, see some of the behind the scenes of the process used on all EWG work and see a blank canvas go to a rough render as much as possible in the two hour session. 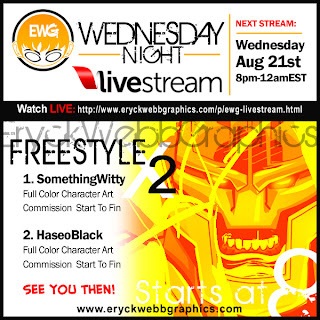 Starts tonight 8pmEST here at www.eryckwebbgraphics.com just click 'EWG Livestream' button on the menu at right and see you then. Tentatively ends at 10pm! September will see a special promotion which EWG hasn't done since the 'Spring Sale', to see what its going to be sure to check it out 9.1.13 - mums the word till then. But I'm sure most commission art and character creator fans will find it a great opportunity for some cool new art and a lot more bang for your buck. See you then! So... lastnight I Livestreamed, working for about an hour, then the next hour was me and 3 viewers ad-libing our own dialogue in the chat over you tube kung fu clips. Sorry donnie yeung. LoL, fun time. But its nothing but seriousness today getting jobs out the door! Hooh Hah! Main reason is I have had a rough morning just didn't sleep well but will be ready to go by tonight's Livestream! And that way I won't have to work on the weekend either (except Jumping Boy of course). And I'm sure the clients won't mind their orders, originally not meant to be streamed at all to be upgraded a bit :) Refer to the recap of Wednesday's, 'EWG Live Wed' to see what to expect. -10pmEST - CandyGirl, niece of MeatMan! 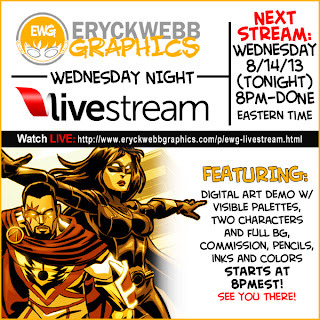 See the clients who ordered them and live art enthusiasts out tonight at 8pmEST! Hope to see a good crowd one mo' time before the weekend! New! 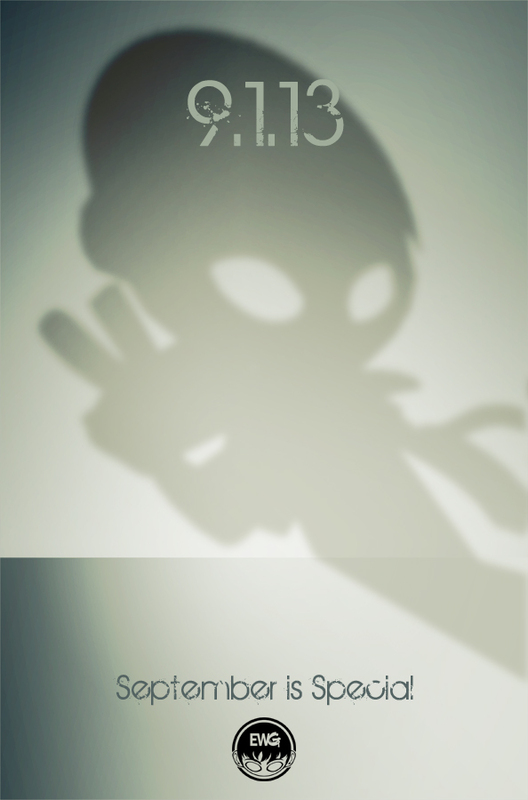 - TnC #7 is out! This one came together really well from my interpretation of the script to cory's colors and I recommend for a good chuckle! Also be sure to catch up on the previous 6 if you haven't seen them already! 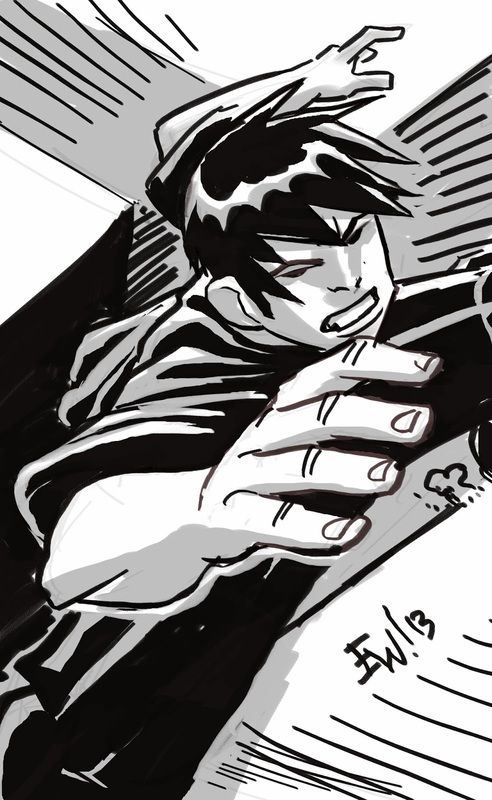 Last-night was a fun Livestream, finally had a good one with no technical difficulties and my hand was nice and loose and cranking on stuff fast and smooth. 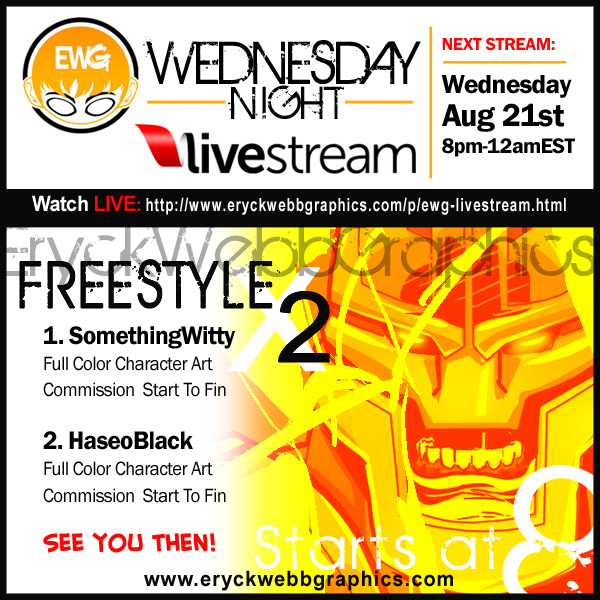 This particular EWG Live Wed featured two $30 slot commissions grabbed up on Tuesday and put up to specificaly be done on Livestream lastnight. 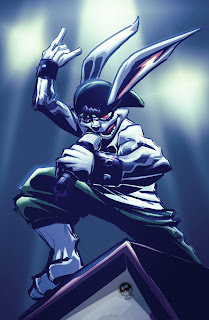 First was the super heroine 'Auroral' at top and then the rap bunny 'Gunner' at bottom. First one took hour and half exactly the second one took hour and 15 exactly. Had a great handful o' the Livestream faithful somewhere between 5 and 7 all night. Was fun. Restores my drive to keep Wednesday Night Livestreams going. Enjoy the event videos below and see you next Wednesday! 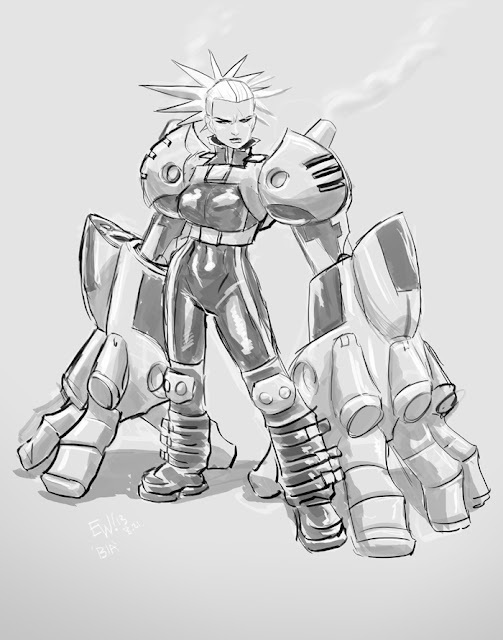 This is this morning's warmup of about 45 minutes to an hour, wanted to nail down the design of this original character of mine, 'Bia'. As the name suggests she is the 'personification of force and violence' and the more violence and opposition around her the more she can feed off of it and the stronger and more violent she becomes. That power is aided by some JCorp power gauntlets. You'd think shes too scrawny but the gauntlets are self supporting, and her fighting style is specialized around the gauntlets. One can act as support on the ground while the other is doing heavy lifting, they both become more invulnerable and strong as she does as she and her power is binded with them. They are supported by her harness and backplate mount which bares any occurring force which is distributed across her back. She gets into them as they sit ready with shoulder/ upper arm parts open she buckles in puts her arms in and they close around. Her actual arms/hands stop at the elbow of this unit and the two arms constantly maintain balance and distribution of forces across the whole framework. Theres various other items like propulsion jets at back of the forearm parts and impact amplifying knuckles, various other things to be disclosed later on. Shes a soldier for JCorp that has earned her power gauntlets through trials of blood and ruthless obedience to her master long before she needed a power upgrade. Now they are just tools at her disposal to make her dirty work that much more effective. Anywho those are sorta notes on this WIP character of mine (Bia as seen/ described here is copyright Eryck Webb 2013) - good morning warmup. Onto some Delusional materials all day. 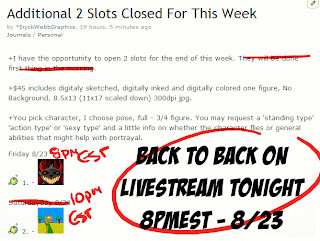 Looking forward to the Livestream tonight, hope to see a good crowd out! Opened up two slots to feature exclusively on Wednesday Night Livestream this week and was happy to have two great clients jump on them same day. Will look forward to bringing their desired characters to life for them, on Livestream! The featured commissions are each one character full color over black and white art and will take approx an hour and half each. The client chooses the character and general attitude of the piece but I come up with an appropriate pose and just have fun with it. The idea is more freestyle jam than perfectionist piece. The offer also saves $15 off the normal price, and is mostly meant to provide an exhibition of my skill and work flow, as well as give the participating clients some art they own to come out and enjoy watching get created live start to finish! Look forward to it! Show starts 8pmEST Wed, 8/21 and goes till done but is not expected to run past midnight. 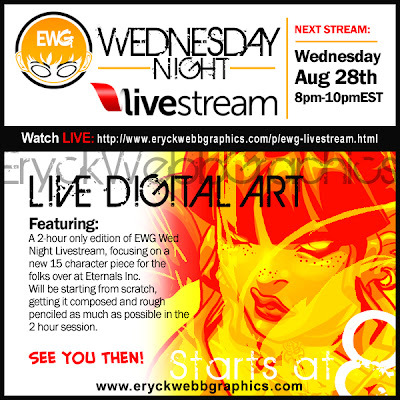 See everyone out at the EWG Livestream button on the menu at right, its always a jammin good time. 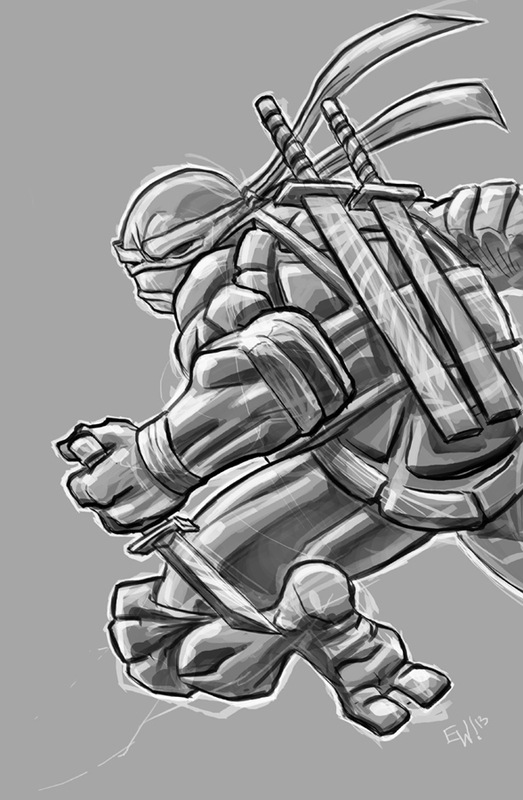 This morning's warmup, of Teenage Mutant Ninja Turtle's 'Leonardo'. Just sketched till I had a pose I liked then finished it out. I thought maybe sometimes instead of the swords maybe hes got a knife stashed on that belt somewhere. Dunno... alrighty, onto customer work rest of the day! Oh, and yeah I realize the angle of the knife and the angle of his hand are sorta not matching up. But hey, thats how warmup sketches go sometimes. Introducing an official price-list designed, and launched for easy reading and ordering for customers everywhere. EWG's retooled business model focuses on the two items it does best and enjoys the most, Character Art (Portrayals, Designs) and Tee Shirt Art ( Small, Large, Raster or Vector). In the last couple quarters I kept tallies of work versus cost and hours versus hourly rate budgeted to all jobs and retooled to price-list a bit. The emphasis was not on changing the prices as much as presenting the focus of EWG and the service options in a clear and understandable manner. Before it was just written in text, and a bit of an eye soar, now I believe its clear and present for customers who have been here a while and new ones feeling it out. I believe for the foreseeable future this should be right where it needs to be. I think most clients and customers will find its exactly like it was before just better mapped out for them. Check it out today here on the EryckWebbGraphics website by clicking the 'Commission Price-list button on the Features menu, or by clicking this direct link here! Heres hoping it makes the whole transaction experience with buying commissions easier for clients and cuts down on custom quotes and answering questions on my end. A win win hopefully. 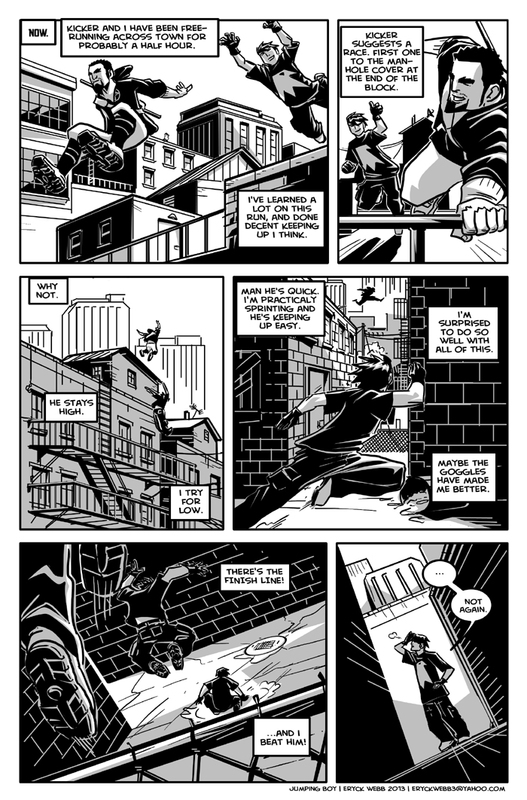 Next I relayout the page for a more finalized composition, loose and simple, in this stage I letter the entire page and ajust placement of the layout of each panel to coexist with the balloons better. Alright, well theres a quick look at process on a Jumping boy page. 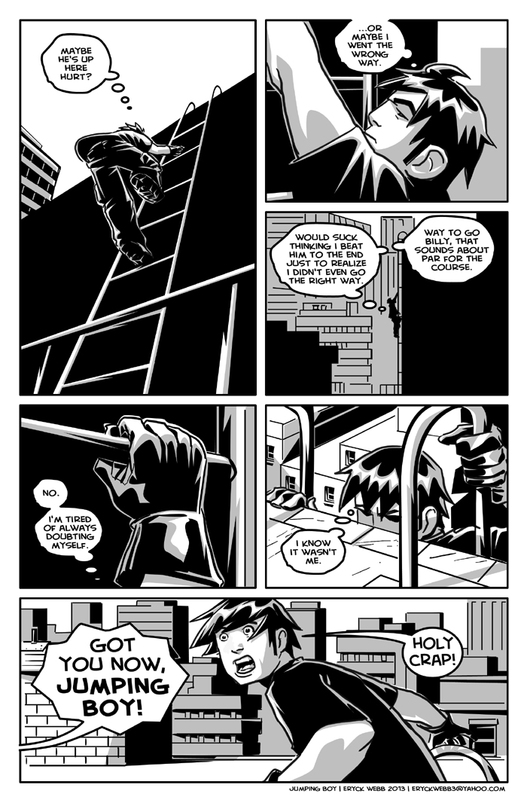 Read the finished page and the new one that came out this morning over at the webcomic homepage: http://jumpingboycomic.blogspot.com and be sure to follow it on facebook! Thanks for checking this out. Have a great Monday and an even better week! Last-night's EWG Wednesday Live was definitely one of the more unusual cases. Started with a 'pre-streaming' power-nap going too long cause an alarm I normally don't use didn't wake me up. Went off at 730pm but didnt make any noise. So 8:15pm I'm scrambling to brew some coffee and get ready to go. Didn't help that when I sat down 8:30 to get things rolling, a recent system restore wiped out Livestream Procaster files so I had to re-install that. The net connections were going dog slow so I reset the router but apparently didn't wait long enough before plugging the power supply in. So it was fairly sluggish all night I think (sorry viewers). This morning I did some heavy comp maintenance and trouble shooting and got my computer and net connection running quick and efficient again. But last-night was just crazy. So, the occasional troubleshooting during the stream last-night left this session with multiple videos. And the art piece itself, seemed to take forever though I wasn't doing a whole lot of extra stuff. But I do think I love the end result of the artwork. I had something else in mind but sorta ended up in a sightly different piece. I think it could be better, but I also think it turned out pretty darn good. Hope the client is happy with it, and hope you who read this article enjoy the break down of the work flow below as well as the 3 parts Livestream videos. Pencils in the first, inks /flats in the second and finish in the third. Next time I know what stuff to check out and test out before I do a live event. Then sometimes there's nothing to expect but random acts of chaos LOL. Thanks to all who came out, those who stuck with me till 2am and thanks for reading this article. One more Livestream event is a WRAP! It was a struggle to start, but ended up great I think. Pushed through, and got another great piece and happy customer under the belt. Cleaned up/ articulated pencils as far as I needed them to figure out where things go in the inks. Don't do it too often but sometimes (like in this piece) like to flesh stuff out basicaly in the pencils, and finish it out/ definte it more in the inks. 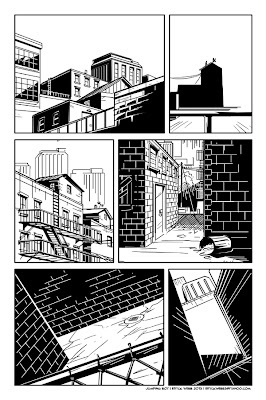 Saves some time and lets me have more freedom in the ink stage instead of making it all defined in the pencil stage then just redrawing it over again in the inks. Creates a less refined look but adds a little whimsy to it as well. And then the shades/highlights and glow effects and etc are added in for the final piece at top. 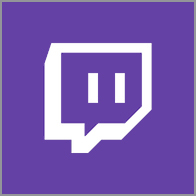 Enjoy the videos below and see you at the next stream! 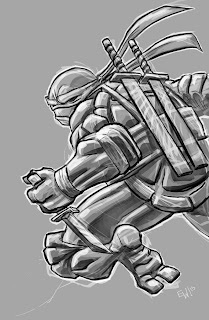 Heres a warmup sketch I did this morning, appropriate enough as this week's new Jumping Boy episode 'Freerunning To The Finish' came out lastnight. Go! Read! 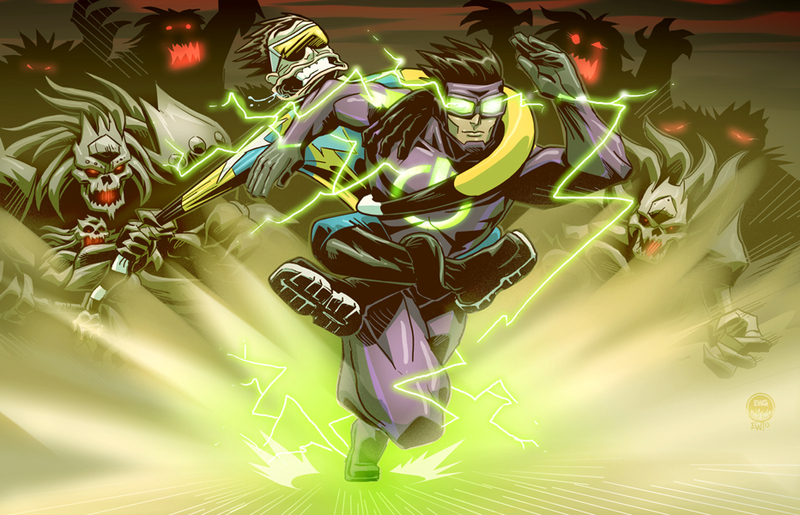 Well happy to say last page of Ungrounded has just been sent out, as of 11:00pm Monday, 8/12/13!! Thanks to Patrick Gerard for the opportunity to work on it with/for him and also thank you for his incredible patience as its been a very challenging year to get through as well as produce this book. 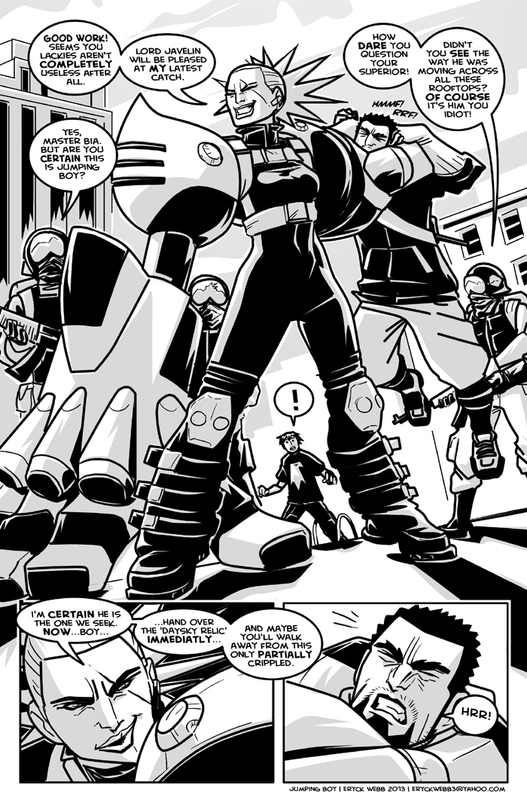 But I think its my best comic work to date and backers/ readers and so forth should really enjoy it. Its not to be missed! Heres to final corrections and gettin this sucker printed!